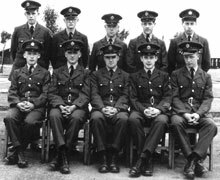 Welcome to this web site about Boy Entrants of the 24th Entry who joined the Royal Air Force at Cosford in February 1955 and graduated from Cosford and St Athan in July 1956. This web site has been set up by Fred Watkins, who trained with the 24th Entry as an Air Wireless Mechanic. The intentions are to share memories, renew friendships, include memorabilia from 1955 - 56, commemorate our 50th anniversary reunions held in 2005 and 2006 and our 60th anniversary reunion in 2015. If you have any comments, suggestions or anything that can be included please contact Fred. 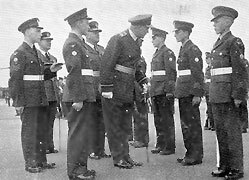 The web site is sub-divided into the sections below to include content about the 24th Entry at Cosford and St Athan in 1955 - 56 and at recent reunions. The Cosford Home Page provides links to pages with memories from Cosford 1955 - 56 and after. The St Athan - Home Page provides links to pages with memories from St Athan 1955 - 56. 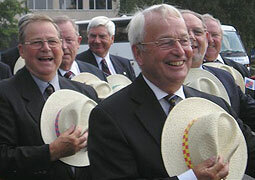 The Anniversaries and Reunions Home Page has links to reports of the 24th Entry reunions in 2005, 2006, 2007 and 2010. The first two commemorating the 50th Anniversaries of joining in 1955 and graduation in 1956. 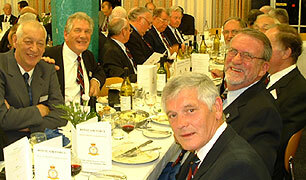 As We Are is about Royal Air Force Boy Entrant Association (RAFBEA) reunions.